Almost anything can be found in seawater. This includes dissolved materials from Earth's crust as well as materials released from organisms. The most important components of seawater that influence life forms are salinity, temperature, dissolved gases (mostly oxygen and carbon dioxide), nutrients, and pH. Each of these is discussed below along with how it varies (or does not vary) and its influence on marine life. The measurements listed in the table above from Castro and Huber's, Marine Biology textbook. 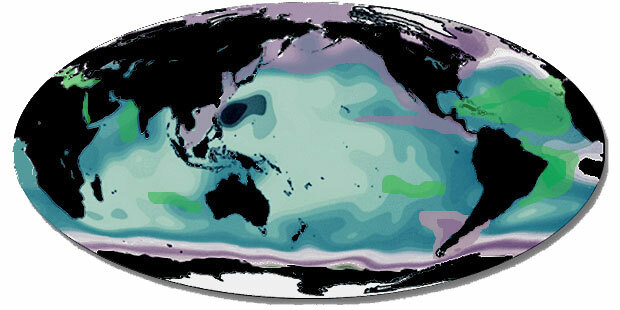 Variations occur in ocean salinity due to several factors. The most common factor is the relative amount of evaporation or precipitation in an area. If there is more evaporation than precipitation then the salinity increases (since salt is not evaporated into the atmosphere). If there is more precipitation (rain) than evaporation then the salinity decreases. Another factor that can change the salinity in the ocean is due to a very large river emptying into the ocean. The runoff from most small streams and rivers is quickly mixed with ocean water by the currents and has little effect on salinity. But large rivers (like the Amazon River in South America) may make the ocean have little or no salt content for over a mile or more out to sea. The freezing and thawing of ice also affects salinity. The thawing of large icebergs (made of frozen fresh water and lacking any salt) will decrease the salinity while the actual freezing of seawater will increase the salinity temporarily. This temporary increase happens in the first stages of the freezing of seawater when small ice crystals form at about minus 2 degrees Centigrade. These tiny, needle-like ice crystals are frozen freshwater and the salts are not part of them so the liquid between these crystals becomes increasingly salty to the point of it being a brine. Eventually though, as seawater freezes, the ice crystals trap areas with brine and the entire large piece of frozen seawater (ice floe) is salty. Osmotic conformers have no mechanism to control osmosis and their cells are the same salt content as the liquid environment in which they are found (in the ocean this would be 35 o/oo salt). If a marine osmotic conformer were put in fresh water (no salt), osmosis would cause water to enter its cells (to form an equilibrium), eventually causing the cells to pop (lysis). If a marine osmotic conformer were put in super salty water (greater than 35 o/oo salt) then osmosis would cause the water inside the cells to move out, eventually causing the cells to dehydrate (plasmolyze). These marine osmotic conformers include the marine plants and invertebrate animals which do not do well in areas without a normal salinity of 35 o/oo. Osmotic regulators have a variety of mechanisms to control osmosis and the salt content of their cells varies. It does not matter what the salt content is of the water surrounding a marine osmotic regulator, their mechanisms will prevent any drastic changes to the living cells. Marine osmotic regulators include most of the fish, reptiles, birds and mammals. These are the organisms that are most likely to migrate long distances where they may encounter changes in salinity. An excellent example of this is the salmon fish. The fish is about 18 o/oo salt so in seawater it tends to dehydrate and constantly drinks the seawater. Special cells on the gills (called chloride cells) excrete the salt so the fish can replace its lost water. When a salmon migrates to fresh water its cells start to take on water so the salmon stops drinking and its kidneys start working to produce large amounts of urine to expell the water. The temperature of seawater varies with the amount of sun that hits that area. This includes the length of time as well as the angle of the sun's rays. The longer the time and the more direct the rays of the sun fall on the ocean, the greater the temperature of seawater. Thus, tropical areas that get more year-round sun and more direct sun (almost 90 degrees, straight down for most of the year at noon) have warmer surface waters than polar areas that may have no sun at all for several months each year and then very steep angles of the sun's rays (never directly overhead at noon). Knowing this about ocean water helps us understand that surface ocean temperatures are warm in the tropics (up to 30 or more degrees C) and cooler at the poles (down to -2 degrees C). But, when we look below the surface we find that the oceans are also vertically stratified and marine scientists recognize a basic three layered ocean - the upper mixed layer, the main thermocline, and deep (bottom) water. The upper mixed layer is all one temperature but that temperature can vary from -2 degrees C, at the poles, to +30 degrees C, in the tropics. It all depends on the latitude and effects of the sun's heat and may be highly seasonal. The depth of this layer can be anything between the surface and 200 meters deep - usually the 200 meter depth is near the equator. The volume of this upper mixed layer is only about two percent of the volume of the ocean water. The main thermocline is an area of rapidly decreasing temperature with depth. This changes with latitude and may begin at 200 meters (the bottom of the mixed layer) in the tropics where it may end at close to 1,000 meters (or anywhere above that depending on the strength of the sun). It may also begin right at the surface of the ocean in high temperate areas and extend to a variety of depths. This layer shifts up and down with the seasons in the temperate areas. The main thermocline comprises only 18 percent of the volume of the ocean water. Deep (or bottom) water is always one cold temperature ranging between -2 to +5 degrees C. It is below the main thermocline (at the bottom of the thermocline there is no longer a decrease in water temperature with depth ... it is all one cold temperature). It is not affected by the seasons. This layer has most of the seawater and comprises close to 80 percent of all ocean water by volume. It is under the tropical areas, most temperate areas when there is a main thermocline, and is all the way to the surface in the polar areas (where there is no thermocline). Seawater temperature affects marine organisms by changing the reaction rates within their cell(s). Although each species has a specific range of temperature at which it can live, the warmer the water gets the faster the reactions and the cooler the water the slower the reactions. An organism's response to water temperature is considered to be cold blooded (or poikilothermic) or warm blooded (homeothermic) depending on their ability to control their internal body temperature. If any species is moved out of its temperature tolerance range it may die in a short time although temperatures on the cool side of the range are easier for organisms to tolerate than temperatures on the warm side because cell reactions just slow down in the cold but may speed up over six times the normal levels for each 10 degrees C of heat. 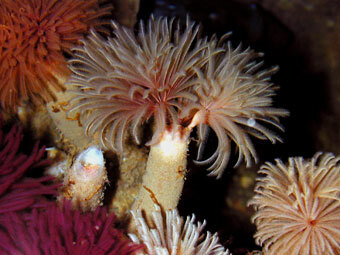 Cold blooded (poikilothermic) marine organisms lack any temperature controls. 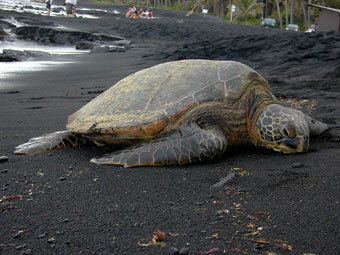 These include marine plants, invertebrates, most fish and marine reptiles. These species each have their specific temperature tolerance range within which they must live (some are adapted to polar temperatures, some to tropical temperatures). Some have a narrow range (and are thus very restricted) and some have a wide range (and are thus less restricted). Warm blooded (homeothermic) marine organisms have some type of internal temperature controls to maintain a constant body temperature. 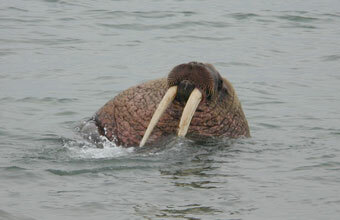 These organisms include a few fish, all sea birds and mammals. This ability allows these warm blooded marine species to migrate over vast distances through various temperatures without problems and include some of the animals on Earth with the longest migrations. Temperature, salinity and pressure affect the density of seawater. Large water masses of different densities are important in the layering of the ocean water (more dense water sinks). As temperature increases water becomes less dense. As salinity increases water becomes more dense. As pressure increases water becomes more dense. A cold, highly saline, deep mass of water is very dense whereas a warm, less saline, surface water mass is less dense. When large water masses with different densities meet the denser water mass slips under the less dense mass. These responses to density are the reason for some of the deep ocean circulation models. The concentration of dissolved oxygen and carbon dioxide are very important for marine life forms. Although both oxygen and carbon dioxide are a gas when outside the water, they dissolve to a certain extent in liquid seawater. Dissolved oxygen is what animals with gills use for respiration (their gills extract the dissolved oxygen from the water flowing over the gill filaments). Dissolved carbon dioxide is what marine plants use for photosynthesis. The amount of dissolved gases varies according to the types of life forms in the water. Most living species need oxygen to keep their cells alive (both plants and animals) and are constantly using it up. Replenishment of dissolved oxygen comes from the photosynthetic activity of plants (during daylight hours only) and from surface diffusion (to a lesser extent). 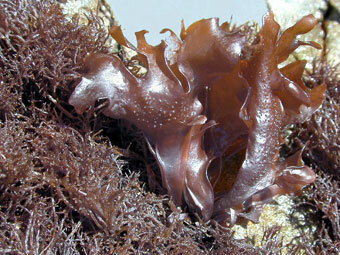 If there are a large number of plants in a marine water mass then the oxygen levels can be quite high during the day. 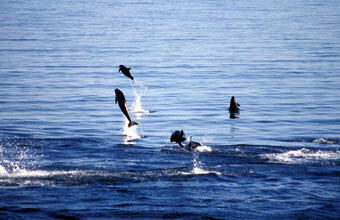 If there are few plants but a large number of animals in a marine water mass then the oxygen levels can be quite low. Oxygen is measured in parts per million (also called ppm) and levels can range from zero to over 20 ppm in temperate waters. It only reaches 20 when there are a lot of plants in the water, it is very sunny with lots of nutrients, and the wind is whipping up the surface into a froth. In any water mass there is a maximum amount of dissolved gas that can be found (after which the gas no longer dissolves but bubbles to the surface). This maximum amount increases with a decrease in temperature (thus cold water masses can hold more dissolved gases ... but they can also have none if it has been used up). So, just because a water mass is cold it does not mean it has a lot of dissolved gases. This concept is a little tricky but just remember that the amount of dissolved gases in seawater depends more on the types of life forms (plants and animals) that are present and their relative proportions. Fertilizers, like nitrogen (N), phosphorous (P), and potassium (K), are important for plant growth and are called 'nutrients.' The level of dissolved nutrients increases from animal feces and decomposition (bacteria, fungi). 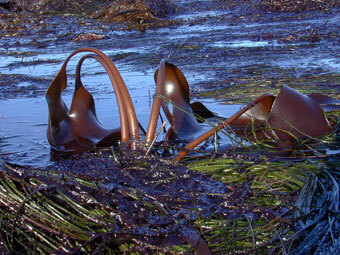 Surface water often may be lacking in nutrients because feces and dead matter tend to settle to the bottom of the ocean. Most decomposition is thus at the bottom of the ocean. In the oceans most surface water is separated from bottom water by a thermocline (seasonal in temperature and marginal polar regions, constant in tropics) which means that once surface nutrients get used up (by the plants there) they become a limiting factor for the growth of new plants. Plants must be at the surface for the light. Nutrients are returned to surface waters by a special type of current called 'upwelling' and it is in these areas of upwelling that we find the highest productivity of marine life. Silica and iron may also be considered important marine nutrients as their lack can limit the amount of productivity in an area. Silica is needed by diatoms (one of the main phytoplanktonic organisms that forms the base of many marine food chains. Iron is just recently being discovered to be a limiting factor for phytoplankton. pH is a measure of the acidity or alkalinity of a substance and is one of the stable measurements in seawater. Ocean water has an excellent buffering system with the interaction of carbon dioxide and water so that it is generally always at a pH of 7.5 to 8.5. Neutral water is a pH of 7 while acidic substances are less than 7 (down to 1, which is highly acidic) and alkaline substances are more than 7 (up to 14, which is highly alkaline). Anything either highly acid or alkaline would kill marine life but the oceans are very stable with regard to pH. If seawater was out of normal range (7.5-8.5) then something would be horribly wrong. In summary, the salinity and pH of seawater are relatively stable measurements whereas temperature, dissolved oxygen, and nutrients may vary. The next lesson will introduce you to how all the water masses of the oceans move around and mix, or do not mix in general patterns. It is always important to remember that every local situation can be quite different than the 'average' so it is always important to take actual measurements.